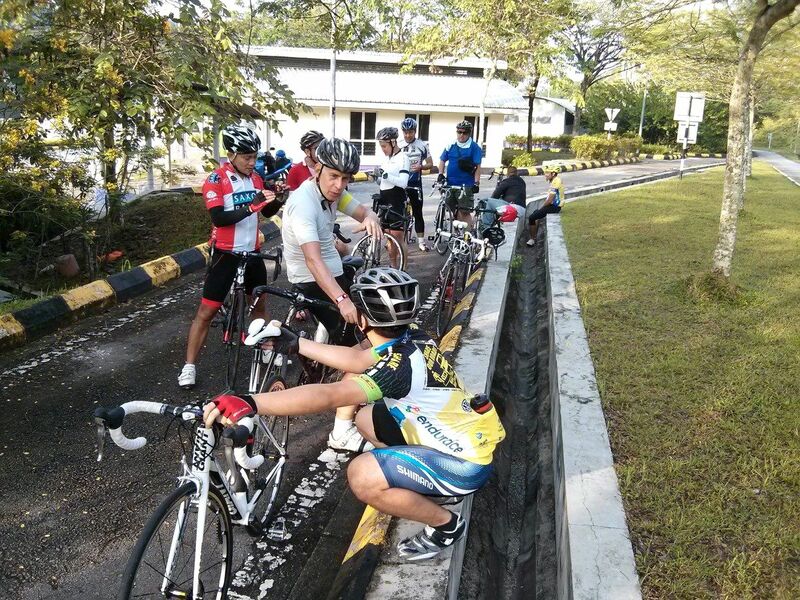 The Racun weekend group rides are usually not longer than 60 km. If we start at 7am we can get to Kampung Kundang for breakfast and back to Bukit Jelutong by about 9.45am or so. Before the day gets too hot. The temperature is the limiting factor when it comes to ride length. 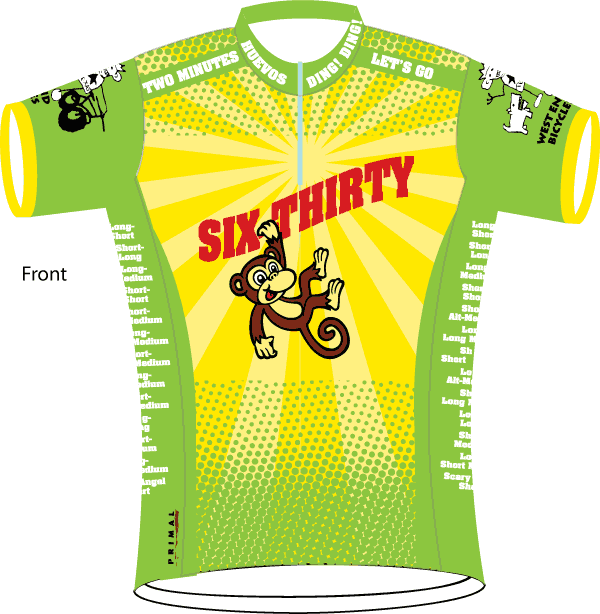 As a result a number of the group have never done a 100 km ride. We decided to rectify that yesterday. 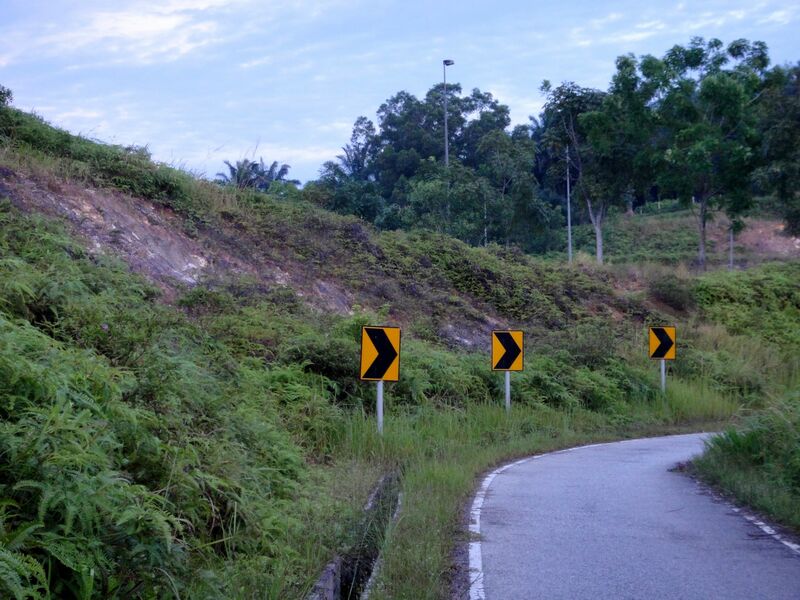 Mark planned a route that would take us from where he lives in Damansara Jaya to the Ijok exit on the LATAR highway and back. About 110 km according to Google Maps. Nine of us met at the car park in front of the Damansara Jaya post office. Marco, Marvin, Peng Soon and Shahfiq were the 100 km ride neophytes (although Marco came close with a 95 km ride last weekend). The route from the start to the Guthrie Corridor Expressway took us past the Sultan Abdul Aziz Shah Airport. From 1965 to 1998 this was Kuala Lumpur’s international airport. When it opened the runway was surrounded by jungle and plantations. 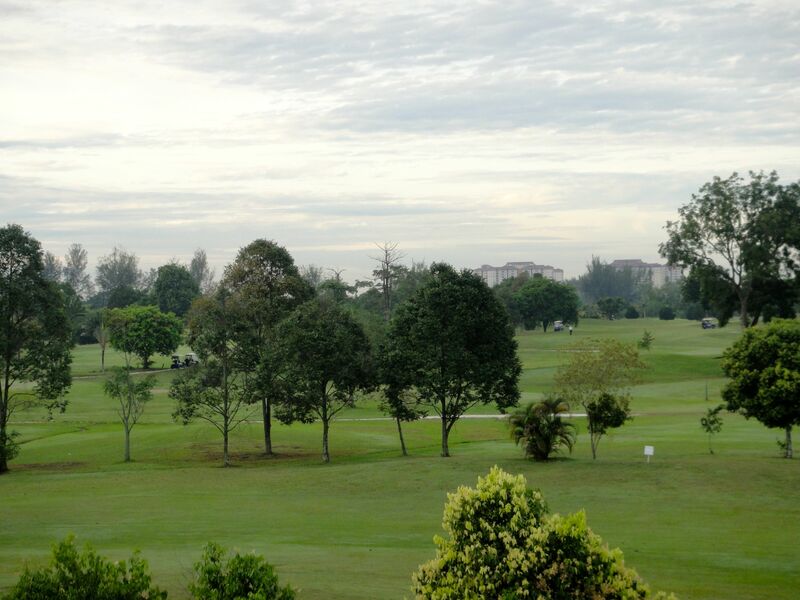 This was still the case when the Saujana Golf and Country Club opened its doors at the south end of the runway some twenty years later. As you can see from the route map below it is hard to justify the “Country” in Country Club these days. The airport and club are now hemmed in by urban sprawl. 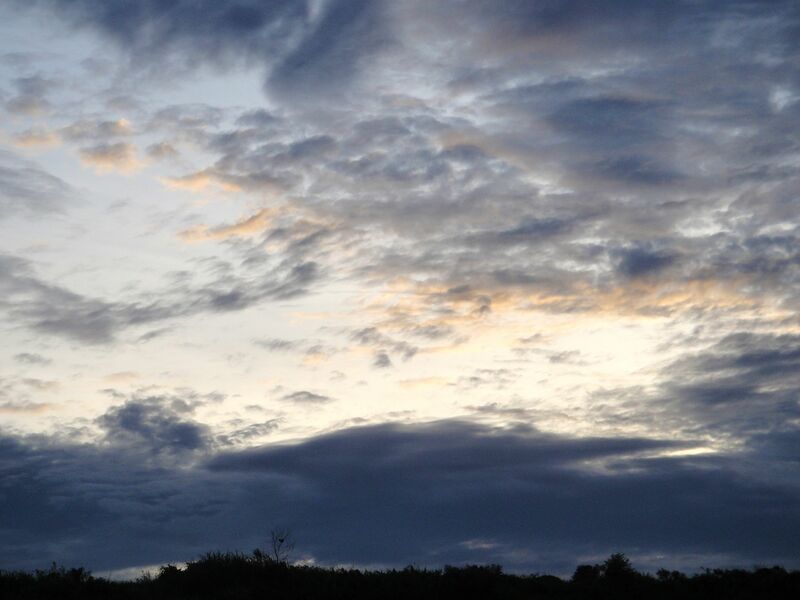 Where there was once jungle and plantations there are now Ara Damansara, Kampung Bukit Cherakah, Taman TTDI Jaya, Taman Subang Perdana, Kayangan Heights and a host of other residential and commercial developments. Jet-engined aircraft now take off and land at the Kuala Lumpur International Airport, which is about 80 km from the city centre. Sultan Abdul Aziz Shah Airport is still used by commercial carriers operating turboprop aircraft. The roads in the area have expanded to cope with the increased traffic. The flyover at the north end of the runway was new to me. 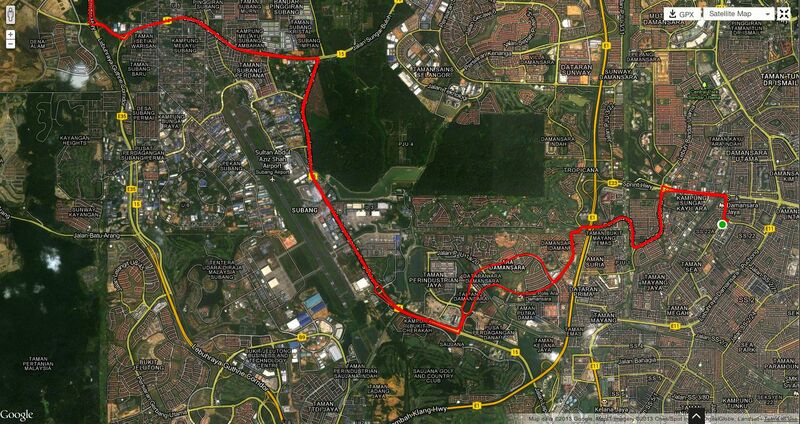 And when did Jalan Lapangan Terbang Subang and Jalan Sungai Buloh become four lane divided highways? Jalan Sungai Buloh took us to the the familiar surroundings of the Guthrie Corridor Expressway. We stopped at the little rest area behind the Lagong Toll Plaza to regroup before turning onto the KL – Kuala Selangor Expressway. Our turn-around point was 20 km down the road at the Ijok exit. Marvin looks ready for the return leg. Marco, Peng Soon and Shahfiq (pointing skyward) look happy to be at the turn-around point too. We chose a hot day for this century run. It was already quite warm by the time we got going again at about 9am. Everyone was getting hungry as well. Good thing a visit to our favourite breakfast spot was on the agenda. An hour later we were seated at Sharif Roti Canai. The corrugated iron roof was radiating heat. We were grateful to get a table under a fan. We lingered under that fan for an hour. 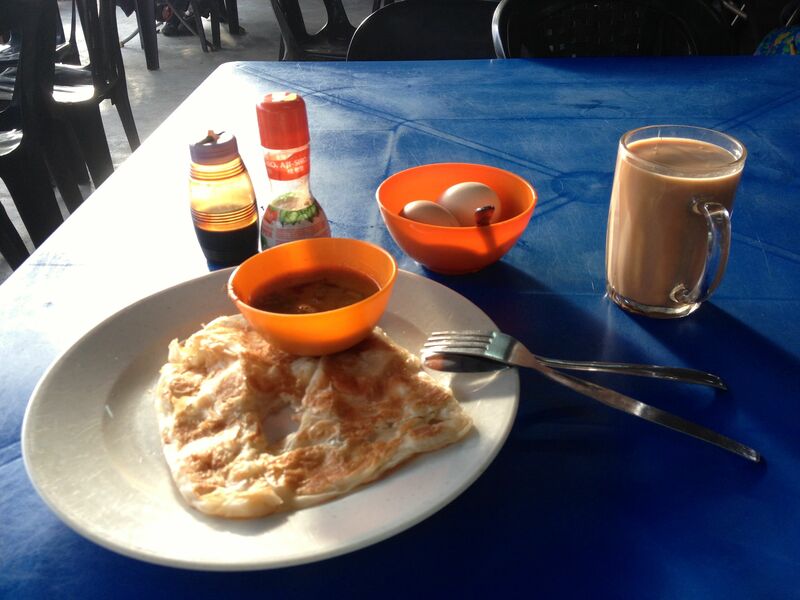 Fortified by roti canai, teh tarik and soft-boiled free-range eggs we headed out to cover the 40 km back to Damansara Jaya. The midday heat and a headwind made the going challenging. We were all glad to get to the Elmina Rest & Recreation area where we could wash the sweat off our faces, pour water over our heads and sit in the shade for a while. 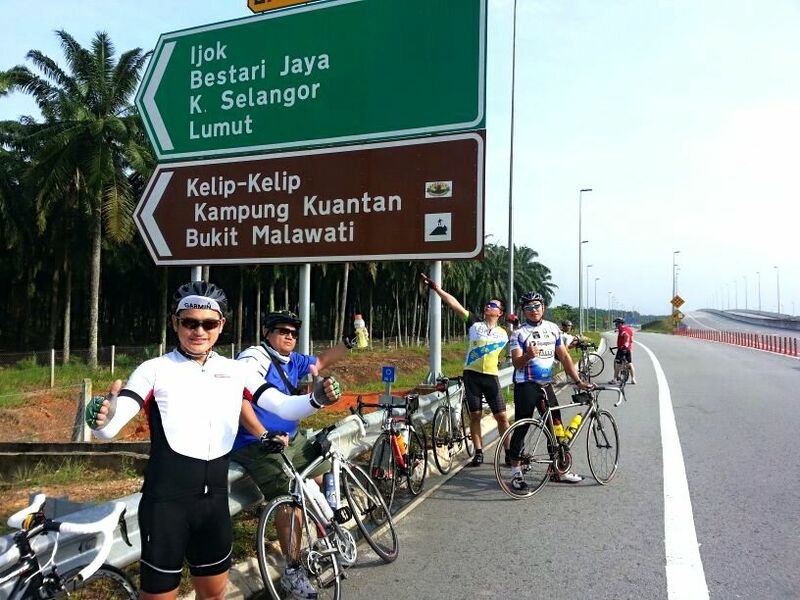 Congratulations to Marco, Marvin, Peng Soon and Shahfiq on their first 100 km ride. Additional kudos go to Peng Soon, who hadn’t ridden more than 40 km in one go before. He persevered despite aching legs and the heat. In sneakers no less. We will all be telling stories about this ride for a long time to come. 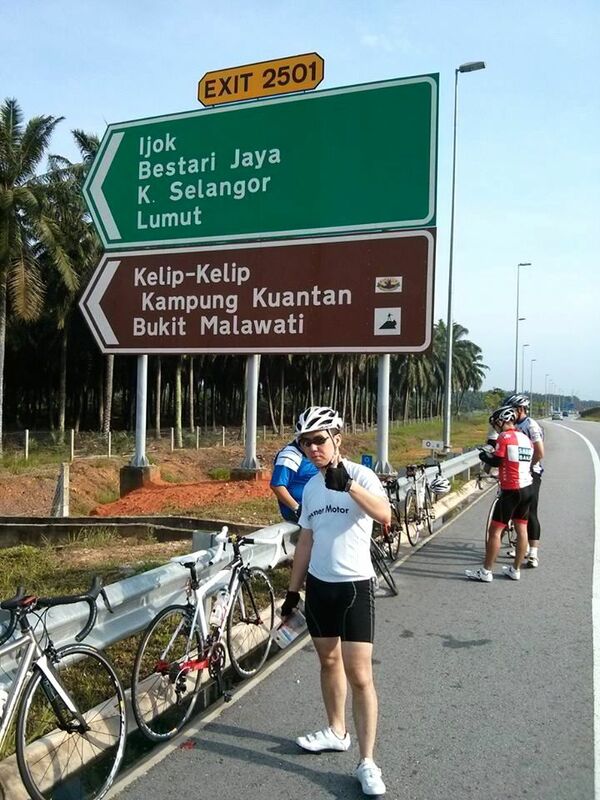 Posted in Cycling in Malaysia and tagged 100 km, Guthrie Corridor Expressway, Sharif Roti Canai. Bookmark the permalink. Life in Malaysia is all about food. So it stands to reason that cycling revolves around finding new places to eat. 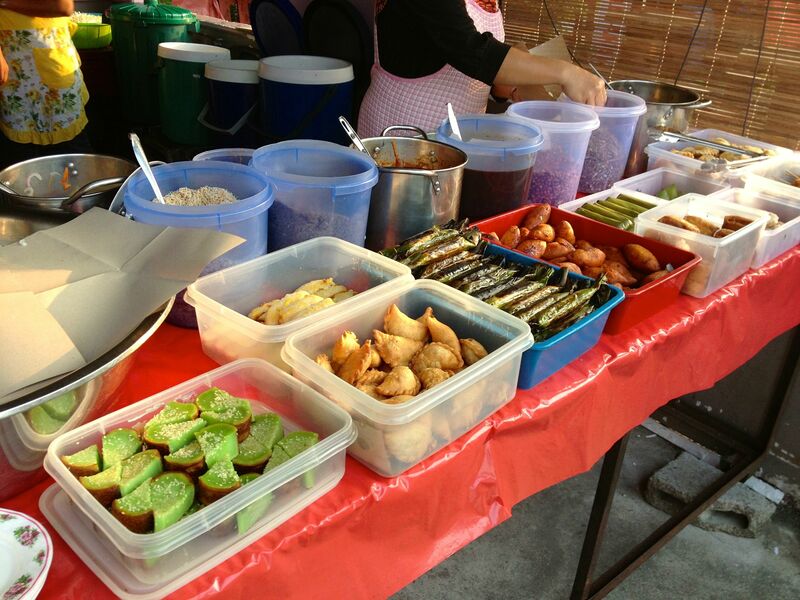 Last week Mark had noticed a particularly well-patronized stall on the Kampung Sri Kundang route. 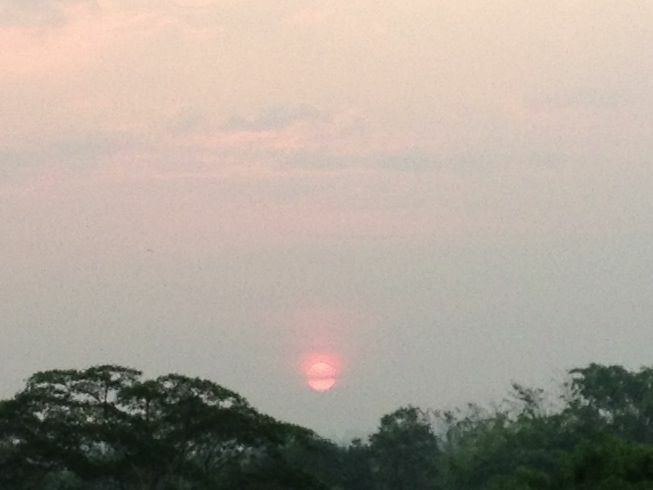 So we set out from Bukit Jelutong just before dawn to check that place out. Our hope was that we would get most of our riding done before it got very hot. The sun had other ideas. 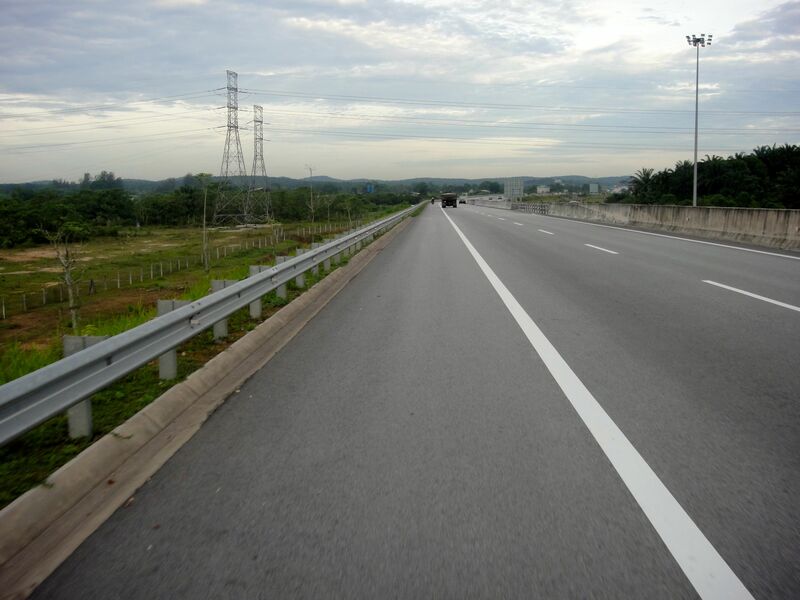 So we kept the pace relaxed along the Guthrie Corridor Expressway and Jalan Kuala Selangor. Mark slowed down as we made the left turn at Kampung Sungai Pelong. He thought we were close to the stall he was looking for. Sure enough, it was 300 meters down the road. Sate Sri Subang has made a name for itself as a place to get good satay. Satay is an archetypal Malaysian dish. In my days of business-class travel on Malaysian Airlines, courtesy of my employers, the beef and chicken satay served onboard was always a highlight. The satay grill comes to life in the evenings. In the mornings the offerings are nasi lemak and nasi dagang. Nasi lemak is available everywhere in Malaysia. Nasi dagang is a dish more commonly found in the northern states of Kelantan and Terengganu. It was no surprise that the ladies running the stall this morning were from Kelantan. Immediately identifiable as such by their Kelantanese dialect. Having been denied our nasi lemak last Sunday, we had our minds set on some today. As we waited for our nasi lemak to be plated up we were tempted by a range of savory and sweet items laid out on the table. Being weak-willed when it comes to food, we added curry puffs, pulut panggang, and kuih koci to our plates. We will be stopping at Sate Sri Subang again. So now we have two breakfast options during our Guthrie Corridor Expressway rides. 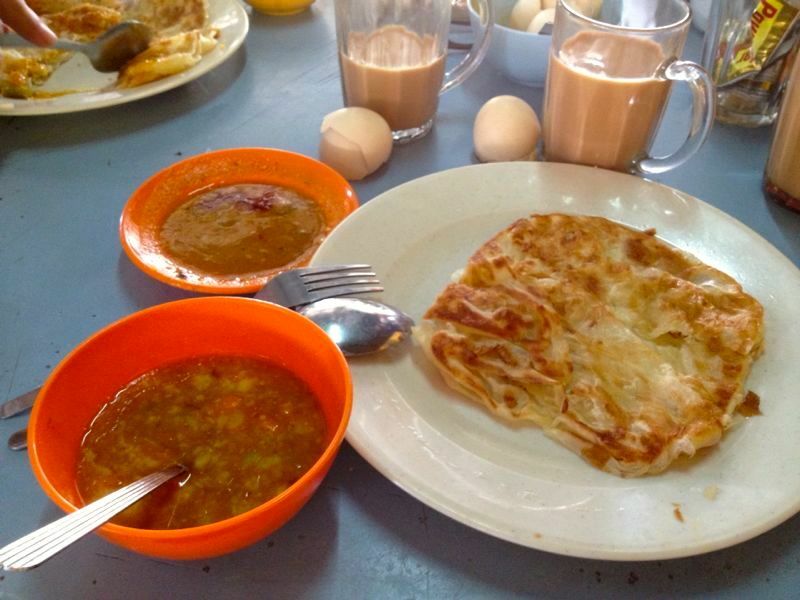 A stop at Sharif Roti Canai in Kampung Sri Kundang is compulsory though. 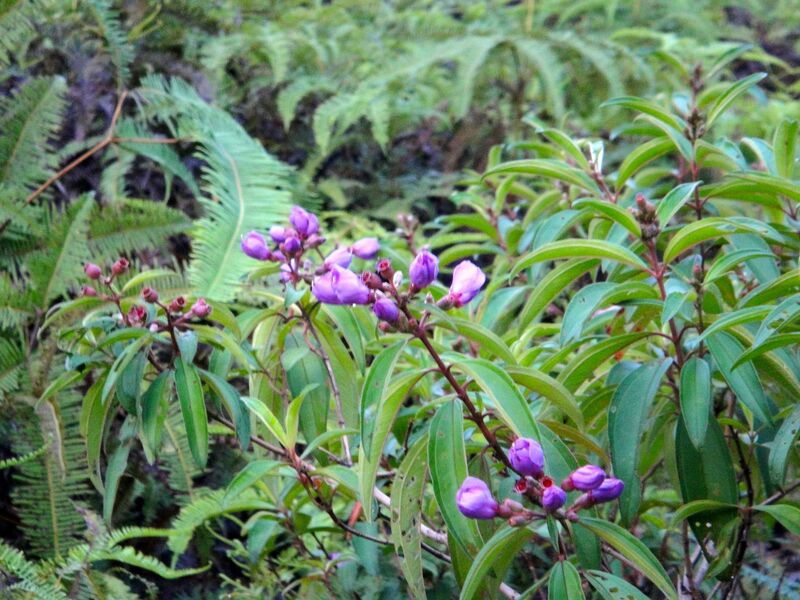 We haven’t found a better teh halia anywhere else. 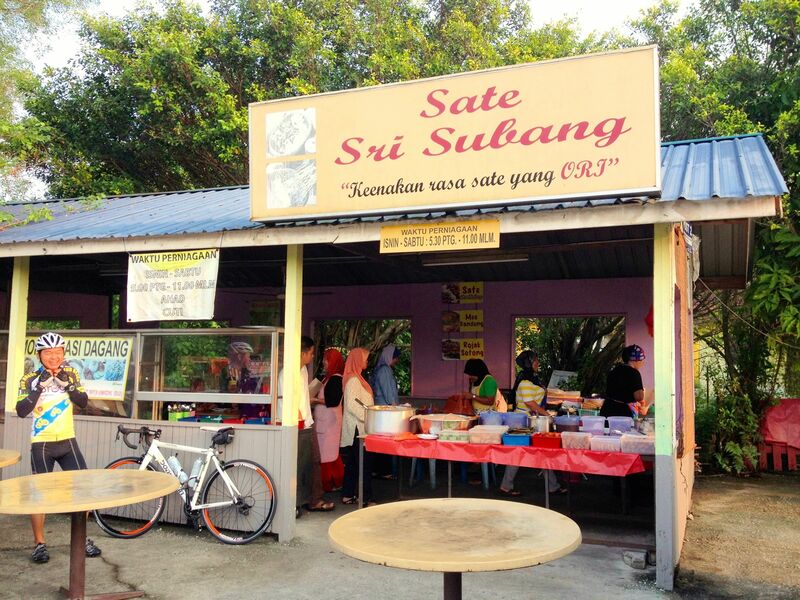 Posted in Cycling in Malaysia and tagged Guthrie Corridor Expressway, Kuih Koci, Nasi Dagang, Nasi Lemak, Pulup Panggang, Sate Sri Subang, Sharif Roti Canai. Bookmark the permalink.